Complete and submit this form between 9 AM and 6 PM EST and we'll call you momentarily; after hours, we'll call you the next day. Our technical sales engineers are the best in the industry, and we look forward to working with you on a backup or storage solution that will exceed your expectations for performance, compatibility, scalability and ease of use. For Technical Support Please Click "Request Technical Support", Below. Better Engineering. Better Pricing. Best Choice. 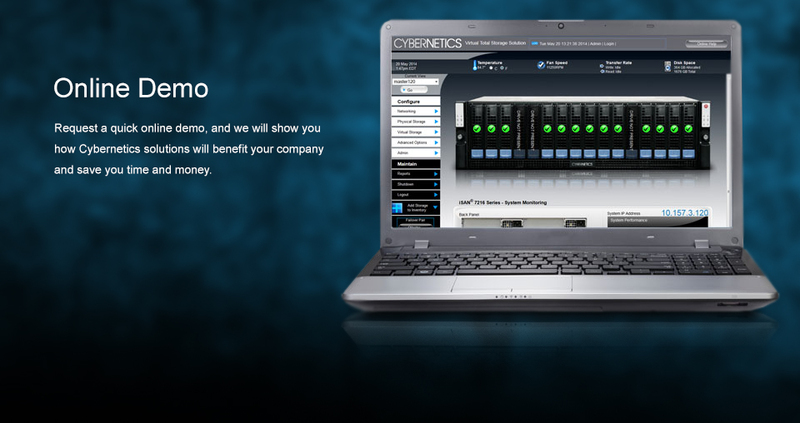 "When it comes to price/ performance and reliability, Cybernetics is as big as all their competition." Add Performance & Capacity as Needed - Easily. iSAN® Outperforms Competing Solutions in Performance, Features, Support and Price. Configure, Monitor, and Maintain with Ease. Call Today And Find Out How Much You Can Save! Manufactured in the USA / ARRA-ELIGIBLE | Copyright © 2018 CYBERNETICS. All rights reserved.